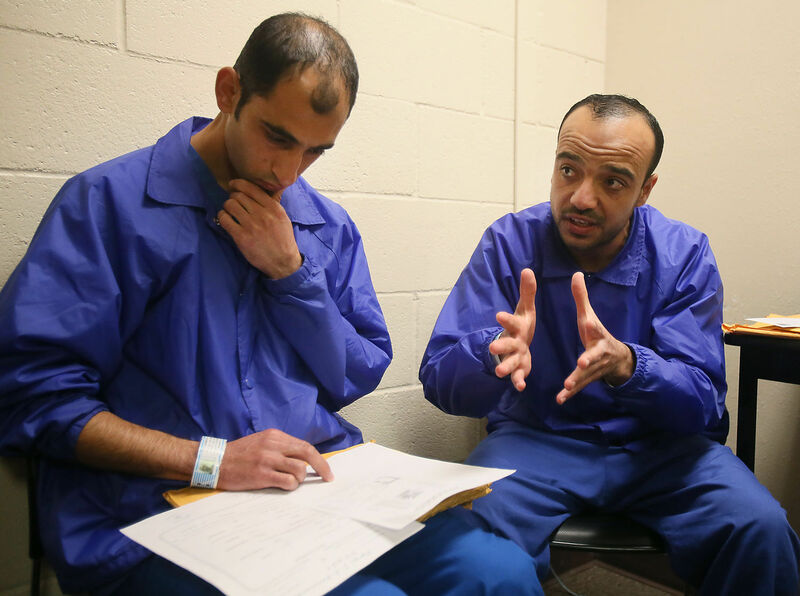 Hisham Shaban, right, and Mounis Hammouda flew to Venezuela from Cyprus, and then traveled through Nicaragua, Honduras, Guatemala and Mexico in order to seek asylum at the port of entry in Nogales. They have been in an immigration detention center since 2014. Photo by Mamta Popat/Arizona Daily Star. Two Palestinians traveled more than 7,000 miles, through eight countries, to present themselves at the port of entry in Nogales more than a year ago. They were seeking refuge in the United States. “Because it’s a free country and you have the right to live as a human being,” Hisham Shabantold an immigration officer when asked why he sought asylum. Both men have been in an immigration detention center in Florence, about 80 miles north of Tucson, since November 2014. In May, after an immigration judge found no evidence that they would be in danger if they returned home, their bond was set at $9,000 each. They said they couldn’t afford it. While the case of Mounis Hammouda, 29, is ongoing, Shaban, 32, is stuck in limbo since his asylum claim was denied in August because an immigration judge didn’t find credible his fear of returning home due to the general political and economic situation in Gaza. His attorneys, who weren’t representing him when the decision was made, believe procedural misunderstandings and lack of evidence to support his claim were contributing factors. Since the United States doesn’t recognize the state of Palestine, it can’t deport Shaban back to Gaza, and the likelihood of other countries accepting him is slim. But the U.S. can’t detain someone indefinitely, so Shaban’s pro bono attorneys will file a petition for his release during his upcoming six-month review, they said. Shaban’s continued detention “seems to violate any principle we have as Americans,” said Liban Yousuf, civil rights director with the Council on American-Islamic Relations in Arizona and one of two attorneys representing both men. And the possibility of sending him to a third country worries them. “We don’t know what will happen to him in any of these countries. We want him to either be released here under supervision or sent back to his family,” Yousuf said. ARIVACA — This tiny town about 11 miles from the border has become the face of growing frustration toward interior border immigration enforcement and checkpoints. But when you get a group of independent-minded people in a close-knit community, nothing is simple. Founded in the 1800s, Arivaca has been a haven for miners, ranchers, hippies, smuggler, addicts and retirees. In the past 20 years, people and drug smuggling has spiked. That led to more Border Patrol agents, surveillance towers and checkpoints, which have come to symbolize concerns about civil rights violations and loss of privacy, the deaths of border crossers and the effectiveness of the Border Patrol. For the last three years, a local group with outside support has called attention to the checkpoint in nearby Amado where vehicles have to stop as Border Patrol agents ask about occupants’ citizenship. Opponents monitor the checkpoint and pass petitions, all in an effort to shut it down. Regardless of whether they are for or against it, at the end of the day it’s a “live and let live” kind of town, residents say. Volunteers with People Helping People, an Arivaca humanitarian organization, are watching and documenting what happens at the Border Patrol’s Arizona Highway 286 checkpoint as part of a campaign to have the checkpoints removed. Photo by Perla Trevizo/Arizona Daily Star. A group of Arivaca residents expanded their Border Patrol checkpoint monitoring campaign on Wednesday to Arizona 286. Nine residents of the small community, about 60 miles south of Tucson, grabbed their clipboards and safety vests and sat across the highway from Border Patrol agents as they inspected vehicles heading north from Sasabe. Their goal was to collect information such as the number of cars that go through, how long they are questioned, occupant ethnicity — when possible — and whether they are sent to secondary inspection. 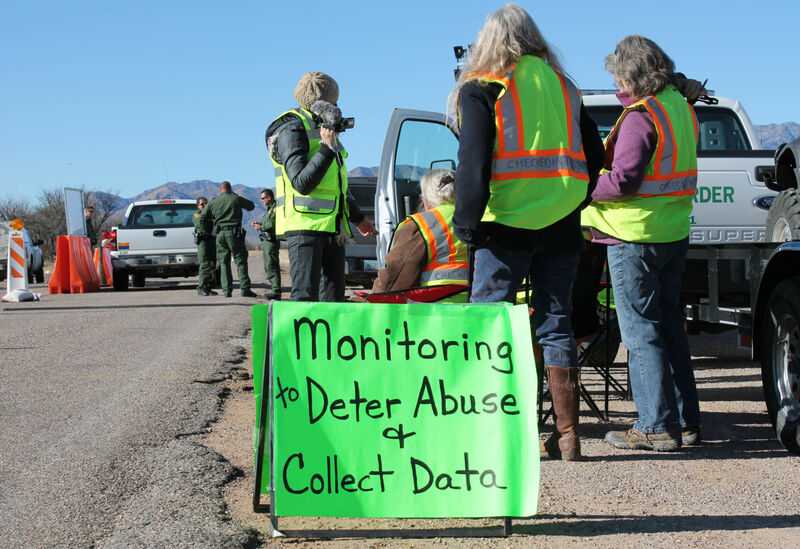 In February 2014, members of People Helping People, a humanitarian group founded in Arivaca, began monitoring the checkpoint on Arivaca Road to document what they said are abuses and civil rights violations from the agency. But after two years, it was time to move to the other checkpoint Arivaca residents must cross to leave the town, said Leesa Jacobson, one of the group’s founding members. When they started, she said, the plan was a few months of intensive monitoring, but they decided to continue on and off after they heard from others that agents were being “nicer,” since part of their efforts are also to serve as a deterrent. Unlike the first time they monitored the other checkpoint, when volunteers said they were met with resistance from the agents who set up enforcement barriers and used their vehicles to block their views, this time the agents were, in general, professional and respectful, said Jacobson. She and fellow member Peter Ragan have a lawsuit pending in federal court alleging First Amendment rights violations. The Border Patrol declined to comment due to the lawsuit. Two people were killed and 22 suspected members of the Sinaloa Cartel were arrested during what is believed to be an unprecedented cross-border law enforcement operation in Sonora, officials say. Mexican officials had been investigating a stash house that was used for drugs and people in a rural area of the border town of Sonoyta, Sonora. The town is across the border from Lukeville, the popular border crossing used to reach the beach town of Puerto Penasco. On Friday, Mexican federal officers raided the property, resulting in a shootout with armed men guarding the property. The names of those killed and those arrested have not been provided, but U.S. Immigration and Customs Enforcement officials said over the weekend that those arrested were in the custody of the Mexican government. American officials were to seek extradition of individuals facing criminal charges here. Mexican law enforcement staged for the operation in Lukeville with the assistance of U.S. law enforcement agencies, which some call a first. “I’ve been living here for 15 years, and there’s no precedent for a mega-operation, even less so of a binational one,” said Hugo Regalado, Sonoyta’s city manager. He said city officials have been talking with long-time Sonoyta residents and no one remembers seeing anything like it before. The operation, dubbed Diablo Express, involved about 15 to 20 Mexican federal police vehicles and four or five helicopters, Regalado said. The city awaits specific information about the operation, he said, noting that local government was not notified before the raid. While the cross-border cooperation is unusual here, a 2011 report by The New York Times noted that the Obama administration was allowing the Mexican police to stage for drug raids from inside the United States. During the rare operations, the New York Times said, Mexican commandos assembled in designated areas in the United States and dispatched helicopter missions back across the border aimed at suspected drug traffickers. That is what has been described in Friday’s raid that launched from Lukeville. Tony Coulson, who retired as the agent in charge of the Drug Enforcement Administration’s Tucson office in 2010, said he had never seen anything like it. “I’ve never heard of anything like this, where armed Mexican police is brought to this side to actually stage an operation into Mexico,” he said. In Friday’s raid, authorities confiscated 15 assault weapons, three handguns and more than 500 pounds of marijuana. Coulson said the drugs and weapons are far less important than who they arrested. Sonoyta is strategically important for the trafficking of drugs into Southern California, Coulson said. “The corridor from Rocky Point to Sonoyta is a critical part of whoever controls the Baja California and Tijuana plaza,” he said. The Sinaloa Cartel is one of world’s most notorious drug-trafficking rings. 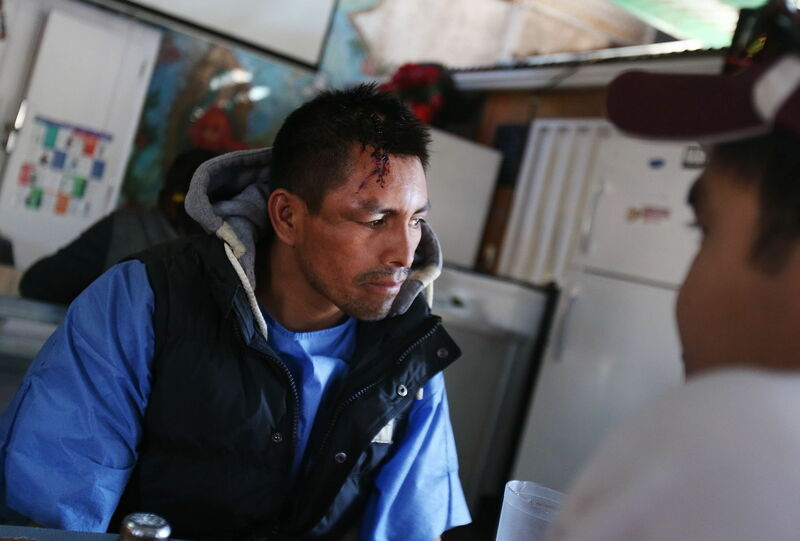 Pedro Santos, 36, of Oaxaca, Mexico, says he got the gash on his head from hitting a rock in the desert. Like many crossers recently deported from the U.S., he was at the Aid Center for Deported Migrants in Nogales, Sonora, assessing his next step. Photo by Mike Christy/Arizona Daily Star. Arrests of people crossing the border into most of Arizona are at the lowest they’ve been in more than 20 years, but apprehensions along the state’s western edge near Yuma are on the rise. For the fiscal year that ended on Sept. 30, Border Patrol agents in the Tucson Sector made about 63,000 arrests — nearly half of the apprehensions they made in 2013, just-released Customs and Border Protection data show. Yuma’s apprehensions rose to just over 7,000 arrests from about 6,000 the previous two years. The picture of the southern border has changed drastically in recent years. Tucson is no longer the busiest sector in the country and Yuma’s apprehensions are far below the more than 100,000 arrests seen in the mid-2000s. As the number of Mexicans coming north declined and the number of people from other countries, primarily Central America, went up, human traffic shifted east to Texas — particularly the Rio Grande Valley, which is the shortest route from countries such as Guatemala, Honduras and El Salvador. With nearly 150,000 apprehensions, the Rio Grande Valley was the busiest sector in the country last year. But the total number of arrests nationwide, 331,000, is the lowest since 1972. 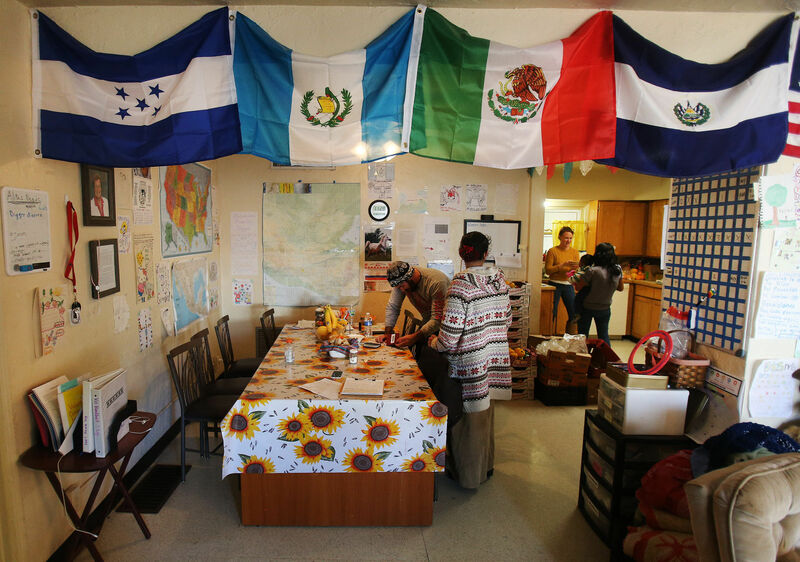 The flags of Honduras, Guatemala, Mexico and El Salvador are displayed at Casa Alitas, which took in 45 families in November and more than 100 in December — a total of about 330 people. Photo by Mike Christy/Arizona Daily Star. The number of Central American families crossing the U.S.-Mexico border is spiking again — just as the federal government is going after the first wave. Immigration officials are targeting migrants who arrived in 2014 and haven’t left despite a final deportation order. On the first weekend of January, Immigration and Customs Enforcement rounded up 121 adults and children in Texas, North Carolina and Georgia who the government said had exhausted all legal recourse. So far, that’s not stemming the tide of Central American families — mostly women and their children fleeing violence and extreme poverty in their home countries — crossing into Arizona on their way to join family members in other states. More than 1,800 unaccompanied minors and 1,500 single parents and their children have been apprehended the first two months of the fiscal year in Arizona. The Yuma Sector in particular has seen significant increases. Nearly 900 families came through in October and November — up from just 59 this time last year — surpassing the 679 families apprehended in the Tucson Sector, Customs and Border Protection data show. Before this recent uptick, the numbers had been dropping. Fiscal year 2015 saw nearly half of the people apprehended in 2014 in part due to increased enforcement efforts in the United States and Mexico. Over the last year, Mexico deported more than 100,000 Central Americans. Last summer, a Catholic Community Services shelter in Tucson received an average of two families a week. But Casa Alitas took in 45 families in November and more than 100 in December — a total of about 330 people, said Jamie Flynn, AmeriCorps VISTA in-house volunteer. Casa Alitas provides a bed, shower and food for families released by the Department of Homeland Security with a notice to appear before an immigration officer at their final destination to continue processing their cases. Volunteers help them get in touch with family members and help them navigate how to buy their bus ticket to get there. The recent migrant roundups drew outrage from immigration attorneys and advocates who say the government is trying to use these deportations to deter others from coming. The federal government has trimmed its immigration enforcement priorities over the past several years, resulting in fewer deportations overall. Photo by The Associated Press. 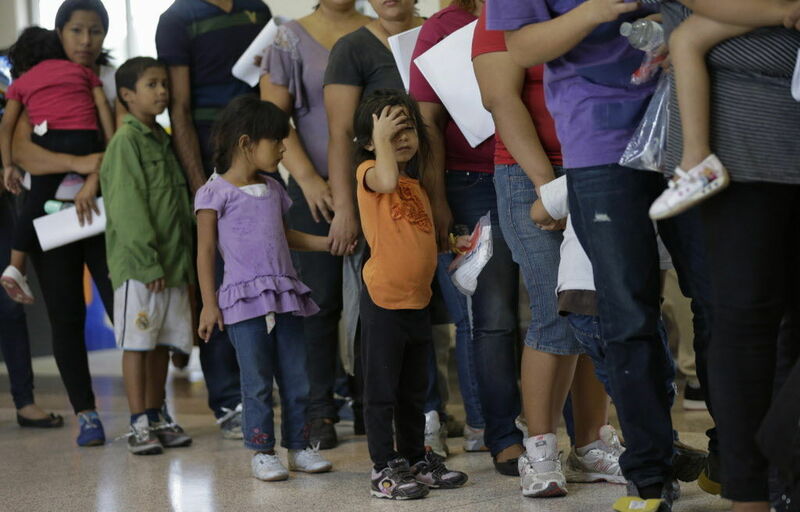 Fewer parents of U.S. citizen children are being deported, both in Arizona and nationwide. Removals of parents with U.S.-born children in fiscal 2014 fell by nearly half compared to 2013, according to data from Immigration and Customs Enforcement obtained through a public-records request. Arizona saw nearly 2,300 removals in 2014 compared to 4,413 in 2013. Nationwide, there were 39,300 removals in 2014 and more than 72,000 in 2013. Over the last several years, the federal government has narrowed its priorities for immigration enforcement, which has resulted in fewer deportations overall, but particularly of those who claim to have children born here. The government has said it wants to focus its limited resources on convicted criminals and those who pose a threat to national security. During the same period, deportations declined 19 percent in Arizona and 14 percent nationally, ICE data show. In 2014, the Obama administration announced the Deferred Action for Parental Accountability, or DAPA, program, which would grant work permits and deferral of deportation to about 3.7 million parents of U.S. citizens or lawful permanent residents. The program remains in legal limbo as more than two dozen states, including Arizona, sued the federal government over it. Obama also discontinued the controversial Secure Communities program, which identified people in state and local jails who could be deported — and in some instances held them for immigration authorities. That has been replaced with the Priority Enforcement Program, which also relies on local law enforcement agencies sending fingerprints to ICE, but now the agency is instructed to take custody only of those who pose a threat to national security or have been convicted of certain crimes and meet the agency’s priorities.